Is a teddy bear dog right for you? In this article, we take a look at some of the world’s cutest and cuddliest dogs. Dogs may be descended from wolves but some adorable puppies look more like bears. Teddy bears, that is! Read on for more teddy bear dog breed info. Find out where teddy bear dogs and mini-teddy bear dogs come from. And discover what’s involved in buying and caring for a teddy bear dog. In fact, teddy bear dogs are not a ‘breed’ of dog. And you won’t discover them listed on the registers of your national kennel club. They were nicknamed ‘teddy bear’ dogs because of their large eyes, soft fluffy fur and small size. Sometimes this appearance is no more than a passing resemblance to a teddy. And sometimes the teddy bear ‘look’ is achieved with the help of some skillful clipping. The name would suggest that these might be ideal companions for children and fit in well with all the family. And with some provisos, that is true. We’ll delve into that more deeply in a moment! 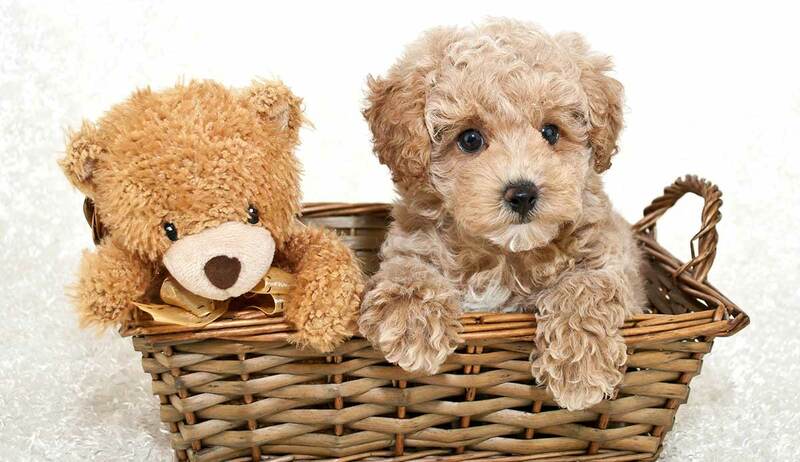 What kinds of dog are used in teddy bear breeding? Bichon Frise and Shih Tzus are the most popular and known as Zuchons or Shichons. Teddy bear puppies were first bred in the 1990s, during the craze for fashionable cross-breeds or ‘designer’ dogs. There are also teddy bear ‘teacup’ puppies. Again, these can be a range of breeds. They are specifically bred to be smaller to satisfy owners who are looking for a mini teddy bear dog. Think of a cute teddy bear dog and you’re probably thinking of a Zuchon, also known as a Shichon. These are small dogs, reaching just 9-12 inches from the shoulder, and are typically a mix of white, brown and black. Although a Zuchon’s coat can change color as it matures. This teddy bear dog full grown can weigh up to 25lbs and live to around 15 years. Zuchons are very active and playful little dogs. They’re intelligent and lively companions and often enjoy being around children. They are happiest when part of a large, loving family. Zuchons are sometimes described as being hypoallergenic dogs. But this can be a misleading term. The so called ‘hypoallergenic’ breeds are mostly curly coated dogs that don’t shed fur all over your home. However, this is partly because the curls trap any shed hair and dander, rather than because they don’t produce any. This means that not everyone with allergies will be able to live with a Zuchon. Regular grooming and bathing is a must, for a Zuchon, and most will need regular clipping too. As they like to play, it’s important to have toys around so your Zuchon can amuse himself. And you’ll need to make sure he gets plenty of exercise to keep him healthy and happy. 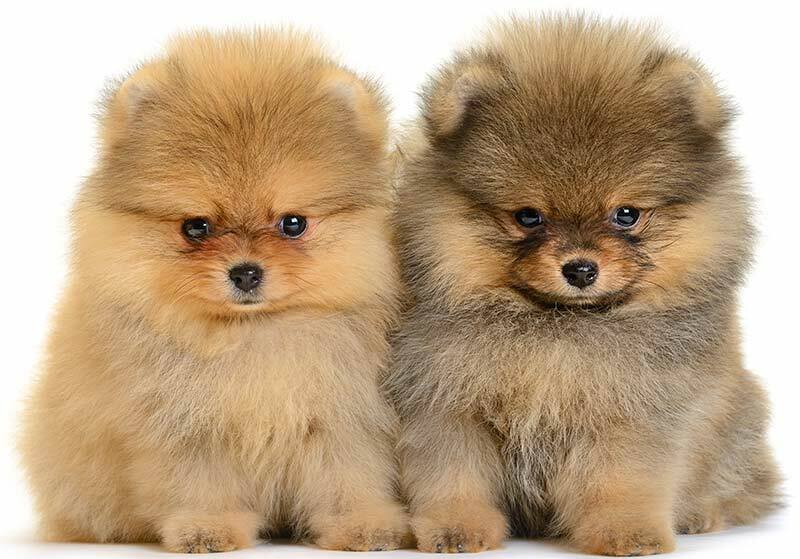 There are two different types of Pomeranian teddy bear dogs. The first are Pomeranians with a teddy bear shaped face, as opposed to the fox face that is the American Kennel Club (AKC)’s standard for the breed. And the second are Pomeranians whose owners have given them a ‘teddy bear dog cut’. This is style first pioneered by a Pomeranian named Boo who became an internet sensation when a photo of his round, fluffy hairstyle went viral in 2010. Many Pom owners followed suit, but breeders and owners have warned that this cut permanently damages the Pom’s thick coat by stripping its protective inner layer. It is also permanent as that inner layer does not grow back. Teddy Bear Pomeranians have short noses and smaller ears than their fox-shaped counterparts, but are otherwise identical. The Pomeranian is a bold and inquisitive breed who likes to play. But most Poms are also quite happy to snuggle up on your lap. This is not the best breed for families with very small children. 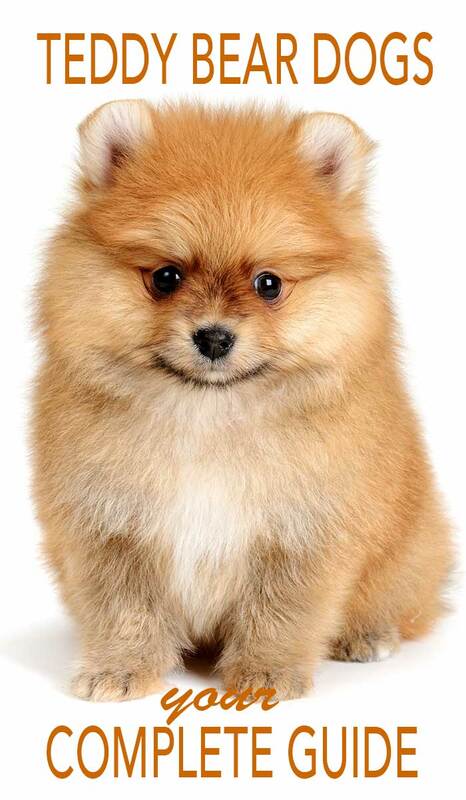 The Pomeranian is not the most tolerant of dogs and its very small size (many weigh less than 7lbs) can be a problem. Like many smaller dog breeds Pomeranian puppies are fragile and very vulnerable to injury. Like all teddy bear dogs this is a breed that need grooming. Some Pomeranians have been bred with excessively thick coats and these will need a great deal of attention. The Pomeranian’s full coat must be groomed frequently and have regular trimming to keep it from getting matted. Although they have a reasonable lifespan, Pomeranians are also prone to a number of health conditions which you need to be aware of. Find out more. 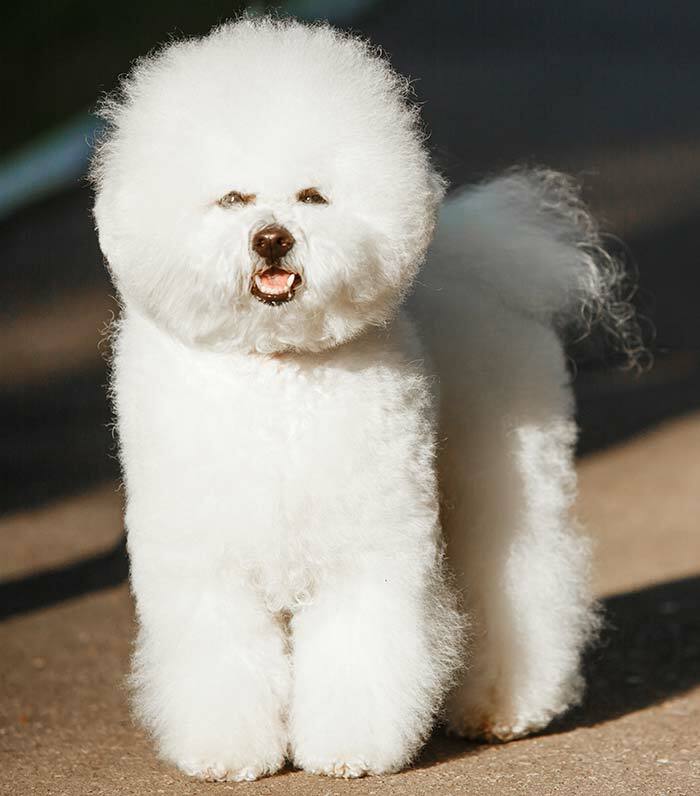 The AKC describes Bichon Frise as “four-legged cotton balls”. Bred to be hypoallergenic (see above for caution on this point), these fluffy furballs are not only adorable, they’re also cheerful, charismatic and very lovable. They are generally a healthy breed with plenty of energy and can live up to 15 years. Bichon Frise are intelligent little dogs who are easy to train and very loyal. Living up to their nickname as a teddy bear breed, they love to get close to their human companions for a good cuddle. On the downside, the Bichon’s coat needs a lot of care and attention to prevent matting and itching. Bichon Frise dogs used for breeding must be tested for hereditary cataracts. A popular parent breed for designer teddy bear dogs, the Shih Tzu can be considered a teddy bear in its own right. They are a toy dog breed, weighing up to just 16 lbs. They are also one of the oldest known breeds, appearing in documents dating from AD 624. Shih Tzu’s have the classic teddy bear face with a shortened snout, large dark eyes and full cheeks. The Shih Tzu has a naturally long coat. While some owners prefer to grow out their Shih Tzu’s silky coat, this can be a handicap to the dog by obscuring it’s vision and tripping it up. Fortunately, the breed looks most bear-like when its fur is kept cropped. This is an outgoing, spunky dog with plenty of personality to match its eye-catching looks. Health wise, the Shih Tzu is also a somewhat brachycephalic breed. That means that these dogs have a shorter skull than nature intended and this can lead to breathing problems and overheating. Another small teddy bear breed is the Yorkshire terrier. With their black and tan coat, short bristly fur and large noses, Yorkies definitely fit their nickname. And with some judicious clipping, your Yorkie will keep his teddy bear looks throughout his life. This breed was first ranked by the AKC in 1885 and originates from England where it was used to catch rats. Yorkshire terriers are a hardy breed, being known for their courage, intelligence and independence. And like most terriers, they are easy to train and very responsive. To create more of a bear-like appearance and capitalize on the trend for teddy bear dogs, some breeders have crossed the Yorkshire Terrier with other small breeds. These include Shih Tzus, Maltese and Pekinese. Be aware that Pekinese are severely brachycephalic and many suffer from breathing problems. If you are considering one of these hybrids, be sure to buy from a responsible breeder. Toy poodles, those 10 inches or shorter, are often considered teddy bear dogs. Because of their thick coat, poodles require daily grooming and a clip every four to six weeks. These tiny teddy bears are elegant and proud and like to show off their striking appearance. The Poodle breed has also been mixed with others to create different types of teddy bear dogs, depending on the look owners want. These include the Poochon, the Shih-poo and the Goldendoodle. The Poochon is a mix between the Poodle and a Bichon Frise. They have a wide fuzzy face and a soft curly coat. Shih-poos are the product of Poodles and Shih Tzus. They are little bundles of energy and very affectionate. With any cross-breed, appearances can vary but Shih-poos generally have the short noses of Shih Tzus with the Poodle’s long ears. Goldendoodles were first bred in 1969 as the offspring of a Poodle and a Golden Retrieve. They were originally bred to be hypoallergenic as they don’t shed. But despite the fact that there is little evidence to support this theory, these are popular dogs for other reasons. 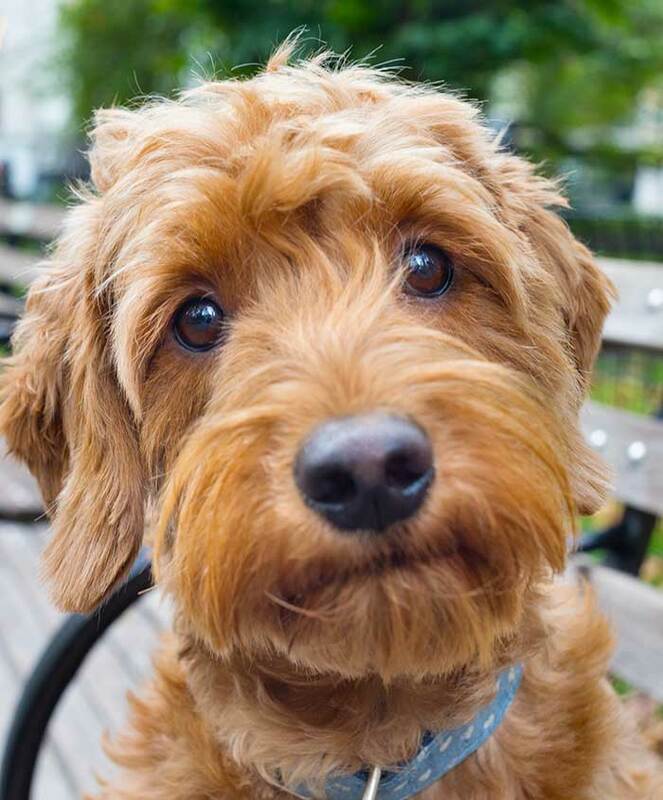 The Goldendoodle can be a wonderful combination of the Poodle’s intelligence and gorgeous curls, together with the Golden Retriever’s willingness to learn and wonderful temperament. This also makes them good candidates for therapy and guide dog work. Shaggy dogs with a luxurious wavy coat, Goldendoodles most resemble teddy bears when they are puppies. Depending on the size of the poodle parent (Poodles come in three sizes), Goldendoodles can be big dogs. Fully grown they can weigh up to 90lbs. Both Poodles and Golden Retrievers have a genetic tendency towards hip dysplasia so their offspring can inherit this painful disease. Golden Retrievers are also very susceptible to cancer so it’s important to pick a breeder whose Goldens are long lived. Be sure to ask your Goldendoodle breeder about your puppy’s parentage, and health history. You’ll need to see copies of health certificates. If you want a smaller teddy bear pup, you might want to consider the Maltese. Maltese are delicate and small. They have long, silky white coats, dark button eyes, and a cute face with an upturned nose. They are the classic lapdog, content to sit and be adored. The AKC calls them “gentle, eager and affectionate”. Because of their long coats, Maltese fur can be easily tangled and they require regular grooming including daily brushing. In fact, most teddy bear dogs need more grooming than short coated breeds. And as a potential owner, that’s something you need to take into account. Neglected coats can be quite a serious problem, and it doesn’t take long for matting to get out of hand. Even more serious though, are the health issues that some of these breeds may suffer from. And we do need to consider those now. The dog breeds that often go to make a teddy bear dog are not without health issues. Many smaller dogs have brain, dental, and eye problems that are caused by squashing a wolf’s brain and teeth into a tiny skull. Some are rather flat-faced or have tracheal (breathing tube) problems both of which can cause respiratory distress. Not only are these problems horrible for the dog, they are upsetting and expensive for you to deal with. Luxating patella – kneecap problems – are also common in many tiny dogs, and in really tiny dogs, it can be hard to keep their blood sugar levels stable. They need multiple tiny meals each day. Small dogs can also be more challenging to toilet train. A good way to find out about all the health problems affecting a particular breed is to visit the Dog Breed Health website. There are certain advantages in being a smaller dog. For example, miniature poodles live almost twice as long as Great Danes and are likely to be healthier throughout their lives. But being smaller is only an advantage up to a point. When we get below a certain weight and size, being miniaturized begins to look like a pretty bad deal for a dog. You can read more about the problems of miniaturization in dog in this article. But it’s clear that teacup puppies are not destined for a long and happy life. If you want your dog to be healthy and to avoid a lifetime of nursing and vet bill, it’s best to stick to the medium to large teddy bears. Is a teddy bear dog right for you? Think about your dog’s coat too. Most teddy bear dogs need regular clipping and frequent grooming. And are best suited to those who can afford to pay a groomer or who are DIY grooming enthusiasts. On the other hand, a small dog can be a great companion for older people or for families with older children. And small breeds are much better suited to apartment living than many larger breeds. As you can see teddy bear dogs come in all shapes, sizes and colors. Some are purebred dogs that can be purchased from breed enthusiasts. For these dogs, you should be able to find a good breeder with a respected background and history. Many teddy bear dogs are cross breeds. There is nothing intrinsically wrong with mixing two different breeds of dog, indeed there are some advantages in terms of health and longevity, to being a mutt, compared with being a purebred dog. But because of the stigma attached to mixed breeds, it can be harder to find a responsible, knowledgeable breeder of crossbreed dogs. The rise of popularity in so-called designer dogs has unfortunately led to a matching rise in the number of puppy mills and unscrupulous breeders trying to make a quick buck from dog owners. So you need to be careful. Try to resist purchasing a teddy bear puppy on the spur of the moment. A hasty decision can lead to a decade of problems. You’ll need to do some detective work before you purchase your puppy. If you have chosen a purebred teddy bear dog breed, the AKC has a list of accredited breeders and can put you in touch with professionals who have been carefully vetted. Teddy bear dog price can vary depending on the breed. When you select your puppy, visit the breeder and take time to get to know their operation. Ask for documentation for any health clearances recommended for the parent breeds, and take the puppy to your own vet for an independent check-up as soon as you get him home. Let your puppy meet the members of the family slowly, especially other furry friends. Secure your home, removing any dangerous items or plants, and give your puppy time to settle in. Once you’ve chosen your pup, it’s time to think of names! This is great fun! Common names for teddy bear pups include Bear, Ted, Buddy, Boo and Tiny. Or some owners like to name their furballs after well-known teddy bears such as Paddington, Winnie the Pooh or Yogi. You’ll find lots more dog naming ideas on the Happy Puppy Site. Don’t forget to fill in the dog name survey while you are there! Enjoy your teddy bear puppy! Whatever name he or she answers to, a carefully chosen, healthy, teddy bear pup will be a faithful and loving companion for years to come. Get plenty of friends round to join in too daily handling and grooming sessions while your puppy is small. This will help to ensure your dog is well socialized and happy to be left at the groomers if necessary.